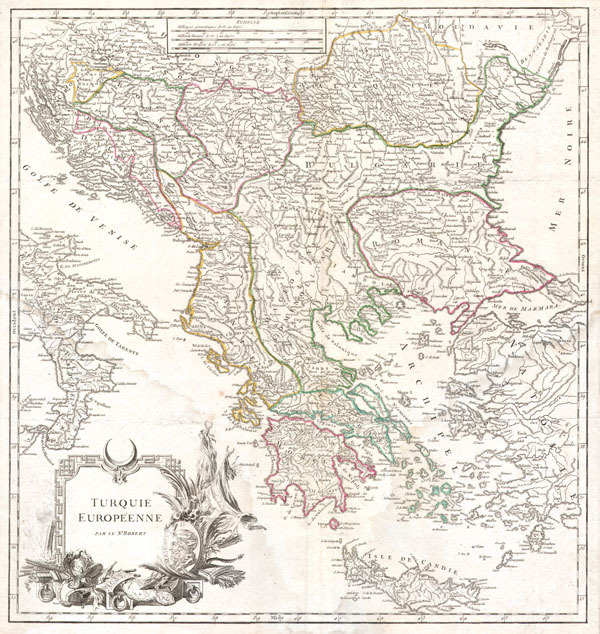 A beautiful map of Greece from De Vaugondy's 1752 Atlas Universal. Depicts the whole of Greece from Bosnia and Croatia east to through Bulgaria and Romania to the Black Sea and south through Macedonia, Albania and the Pelopenesus to the Isle of Candia or Crete. Includes Parts of Anatolia (Turkey) and the boot of Italy. Bottom left decorated with an elaborate title cartouche. The Atlas Universal was one of the first atlases based upon actual surveys. Therefore, this map is highly accurate (for the period) and has most contemporary town names correct, though historic names are, in many cases, incorrect or omitted. Printed in 1752. Very good condition. Minor water stains bottom left and right. Wide margins. Original platemark and centerfold. Blank on verso. Phillips, 619 (1757/1758); Pedley. Belle et utile, p. 227, 385; Fordham, Studies in Cartobibligraphy p. 165; Rumsey 3353.087.